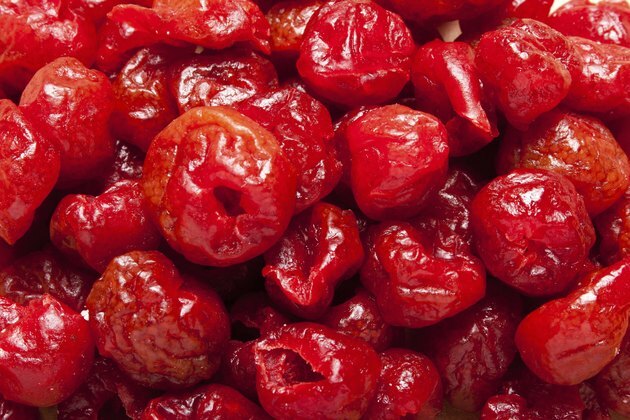 What Are the Benefits of Dried Cherries? With their vibrant, deep red color and tart but sweet taste, dried cherries make for a flavorful addition to your diet. They provide fuel you need to get through the day -- each quarter-cup serving of dried cherries contains 133 calories -- and each quarter-cup serving of dried cherries makes up one-fourth to one-third of the daily recommended fruit intake for women and one-quarter for men, according to USDA guidelines. They also provide some essential vitamins and minerals that support your health. Cherries serve as a good source of copper, an essential mineral. Your body relies on copper to aid collagen production, a process needed to keep your tissues strong. Copper also supports tissue health by protecting you from free radicals -- compounds that would otherwise contribute to tissue damage -- and by helping your cells produce energy. Each quarter-cup serving of cherries contains 92 micrograms of copper, or 10 percent of your recommended daily intake. Add dried cherries to your diet and you'll also boost your intake of vitamin C. Each quarter-cup serving contains 8 milligrams of vitamin C -- 11 and 9 percent of the recommended daily intakes for women and men, respectively. Like copper, vitamin C boosts collagen production, so it contributes to tissue strength, and it protects you from free radicals. Getting enough vitamin C in your diet also supports new tissue growth and aids in wound healing after injury. Dried cherries come packed with beneficial vitamin A. The vitamin A from your diet supports new cell growth, and it plays a role in wound healing and immune function. It also supports health vision and nourishes your skin. Each quarter-cup serving of dried cherries boasts a vitamin A content of 1,132 international units. This makes up 38 percent of the recommended daily intake for men and 49 percent for women. Dried cherries' sweet flavor makes them welcome in salads. Combine them with chopped roasted walnuts and sliced pear over a bed of dark leafy greens, such as spinach or arugula. They also work well in grain salads -- for example, a mixture of quinoa, fresh mint, dried cherries, sliced oranges and an orange juice vinaigrette. Alternatively, add them to tuna or chicken salad for use in sandwiches, or bake them into whole-grain muffins.